I have always been a huge Harry Potter fan, but had yet to make a wizarding world themed costume! 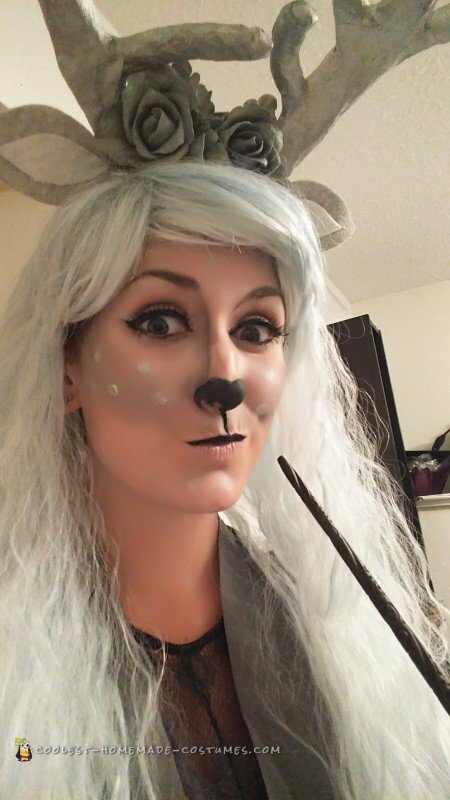 I wanted to do something beyond the more commonly found Hogwarts students, and decided to to make my version of a stag as a Harry Potter Patronus costume! This was a really fun homemade costume to wear and really easy to make! To start, I needed to find the perfect dress. I wanted something more elegant and flowing (since the Patronus is a beautiful silver piece of magic!) and found the perfect dress at a thrift shop (Value Village) which was a light grey color. I then used a fine glitter paint I bought from the craft store (Michael’s) and covered the dress so I shimmered with every step. 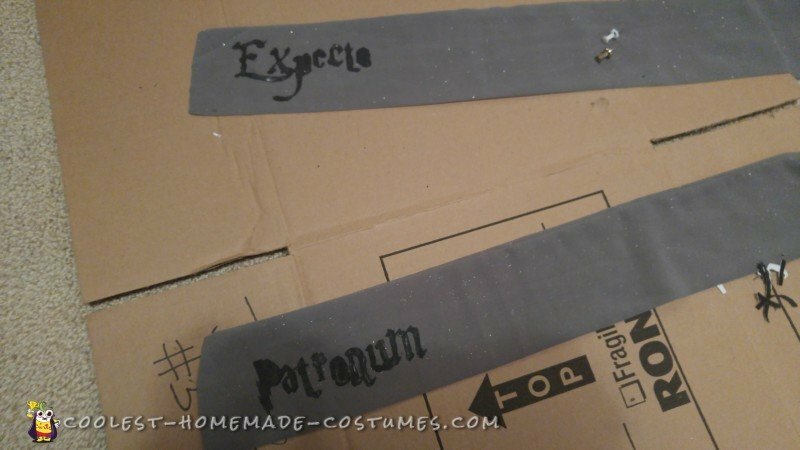 My dress also had very long ties on it (it is a halter style and I wrapped the ties around my neck, crossed it over my back and around my waist) so at the ends of the ties I used black fabric paint to add the Patronus charms enchantment, “Expecto Patronum”. It gave the illusion of someone muttering the spell as I walked! Next I had to make the antlers. I used tin foil to mold the base shape of the antlers, then used a thick packing tape to keep my shape in place once I was happy with the outcome. I secured it by doing a couple layers of paper maché. 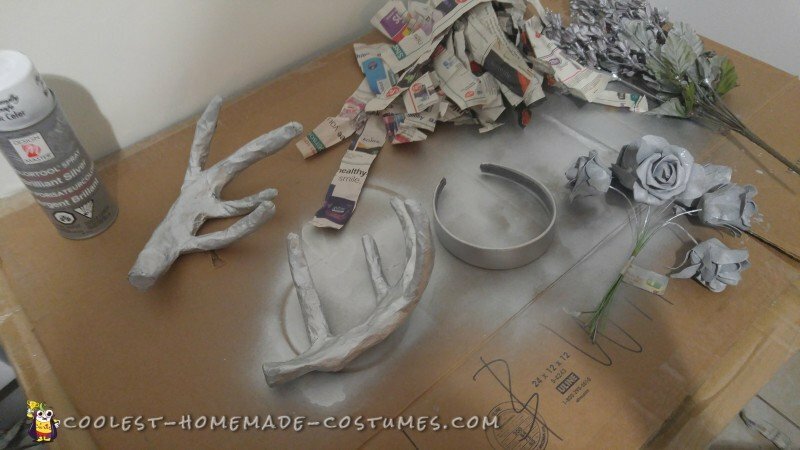 Once dried, I used silver spray paint to coat the antlers. I also painted some dollar store fake flowers and the headband. I used light grey and white craft felt to make the ears. Once everything was dried it was time to put it all together. I used a regular got glue gun to attach the antlers, ears and flowers to a headband. I also added more glitter to all the pieces so I shimmered head to toe. Extra things I used to make my costume complete were a lacey bralet that covered my cleavage so it was more elegant, a blue/white wig for regel hair, and of course the makeup! 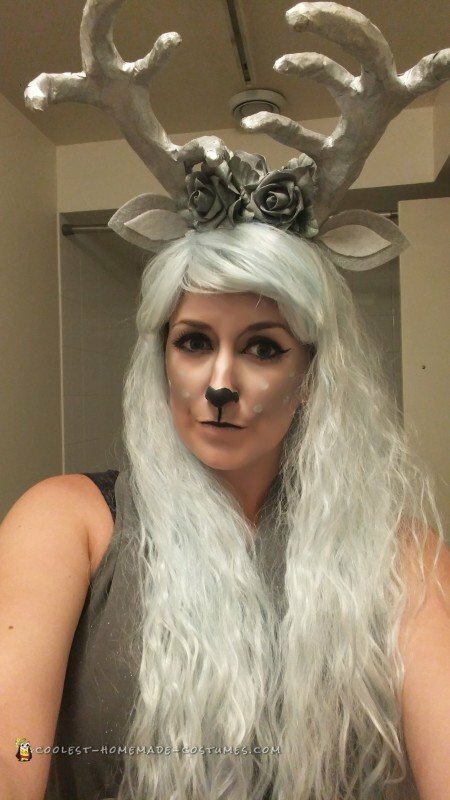 I followed some YouTube deer makeup tutorials and used silvers and greys in place of the typical browns. 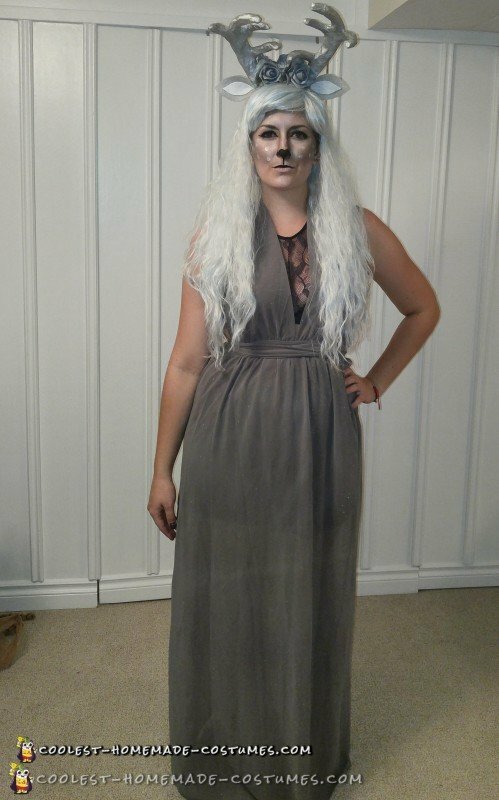 I am so in love with how my Harry Potter Patronus costume turned out! After wearing it to a house party for Halloween, I won for best costume at the party. And left with a pretty great swag bag! I was getting compliments all night long. Fellow Potterheads especially loved this unique idea for a Harry Potter costume. I can’t wait to find more reasons to wear it!